Have you seen these great images by Artistic Outpost? Robyn's got some awesome images that lend themselves nicely to techniques from the TJNL. 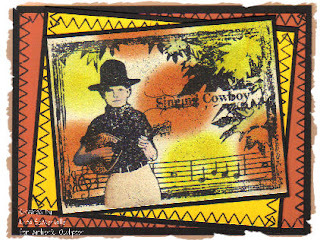 On this card, I've used an image from the Singing Cowboy sheet along with the stitches from Hair is Important and the Burnished Watercolor Technique from the 08/07 issue of the TJNL. FABULOUS artwork Lisa! Love the colors you chose. WOW, love all the detail on this card and the colors are so vibrant, excellent job!